Poor air quality can cause discomfort and may even prove harmful, which is why continually maintaining air quality is so important. People who suffer from allergies, or those who endure certain health conditions, frequently encounter difficulty in homes that lack a clean air flow. The United States Environmental Protection Agency urges homeowners to take proactive measures to maintain a good quality of indoor air. The agency recommends circulating fresh air from outdoors through the premises and using air purifying technology to remove pollutants.1 Sophisticated air scrubbers that help eliminate circulating gases such as formaldehyde from new furniture are widely popular in today’s market. These HVAC cleaning units also help remove dust, paint particles, sawdust, and other debris sometimes discovered in homes following construction projects. Air scrubbers perform another important function, too. These devices usually help protect or supplement the operations of centralized home and industrial heating and cooling equipment. By removing circulating debris from the air, they perform a beneficial role in assisting the operation of air conditioning filter systems. In fact, many air scrubbers include extensive HEPA filters of their own. Easing the burden of an HVAC unit’s built-in filter assists the efficient operation of this expensive equipment. Some manufacturers design air scrubbers to work in conjunction with specific central air conditioning and heating brands. Although not the chief function of most air scrubbers, these units indirectly also contribute to improving air quality by helping to eliminate some lingering odors from the premises. Consider the impact of dirty air; it typically includes many circulating dust particles and other material which may carry pungent odors. To the extent air purifying technology helps reduce the particulate burden of indoor air, it also promotes the circulation of fresher, odor-free air. Maintaining the air scrubber’s capability to perform this role matters to many property owners. It usually makes sense to ask your HVAC technician to replace air scrubber HEPA filters during visits to conduct routine maintenance on a central cooling and heating system. If your HVAC system lacks an air scrubber or uses an outdated model, then it is recommended that you obtain new equipment. There are a variety of HVAC companies who can help you find the right model for your home and help you maintain your system so that its longevity is not cut short from neglect. Being proactive and seeking services before a problem arises will allow your air quality to stay its purest at the lowest price. Consider adding an air scrubber to your home so that its guests will always feel comfortable. Citizens of the United States and other developed nations are facing a similar issue: poor indoor air quality. In some cases, it poses significant health concerns as illnesses caused by air quality can be silent and undetectable. Indoor air quality is not a personal matter, but a public hazard as it can affect anyone who steps within its walls. This brief article will discuss some of the most common sources of indoor air pollution. The United States Consumer Product Safety Commission attributes some residential air quality concerns to poor ventilation.1 The circulation of air into the home from outdoors helps prevent the buildup of airborne pollutants indoors. While it remains important to maintain energy efficiency, residential properties should never become completely airtight. Simply opening windows and doors often helps alleviate this problem. Installing screens may enhance the comfort of residents by permitting a breeze to flow into the interior while excluding flying insects. While central air conditioning and heating units offer many advantages, this equipment will re-circulate dirty air in the absence of regular filter cleaning or replacement.2 Asking your HVAC company to regularly perform this type of routine maintenance promotes better indoor air quality. Since a central air conditioner circulates air throughout the residence, taking this step ensures interior air will pass through an effective, clean filtration system. One major contributor to indoor air pollution proves challenging to detect in the absence of testing. A wide array of gases potentially causes problems in domestic settings. These materials run the gamut from radon, second hand smoke, and carbon monoxide, to a variety of volatile organic compounds (“VOCs”). The latter include formaldehyde, paint, and air fresheners. Sophisticated alert systems assist homeowners in detecting some of these materials, including radon and carbon monoxide, two of the most dangerous gases. Maintaining space heaters, stoves, and furnaces in good working order reduces carbon monoxide hazards. Installing air purification systems may help reduce the presence of circulating second hand cigarette smoke and VOCs. Finally, allergens such as pollen, dander, and mold spores also sometimes cause indoor air pollution problems for susceptible individuals. These contaminants may enter a home from a variety of sources. As air circulates from room to room, some allergens become airborne. Cleaning vents and air conditioning filters routinely and installing air scrubbers (or other air purification technology) offers valuable assistance in tackling this problem. Considerable evidence suggests poor indoor air quality stems from a number of sources. Inadequate ventilation, dirty air conditioning filters, noxious gases, and allergens all sometimes cause indoor air pollution. Yet homeowners possess the power to alleviate these hazards! Make sure your residence receives adequate ventilation from the outdoors. Clean household vents frequently. Ask your HVAC company to replace dirty air conditioning filters. Test your home’s radon and carbon monoxide levels, and maintain all space heaters, furnaces, and stoves in good working condition. To combat allergens, consider installing air purification systems. Taking these steps enhances the safety and comfort of living spaces by improving the quality of indoor air. While a central A/C system offers the most efficient and cost-effective cooling, the exterior unit and equipment can often be an unwelcome addition to a home’s exterior. From well-placed shrubs to an ornate trellis or eye-catching vertical garden, there are plenty of clever ways for homeowners to disguise their A/C unit. By concealing their HVAC system, homeowners will be able to create and maintain a more attractive exterior, one that can help to enhance the curb appeal of a property and may even boost the market value of a home without having to sacrifice their household comfort. 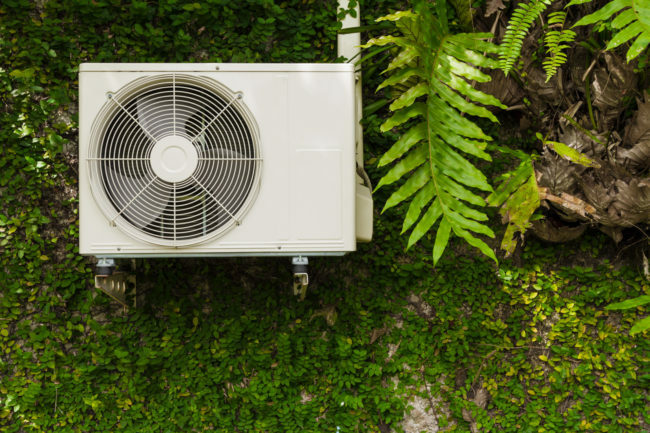 A line of bushes or a few low-hanging trees are one of the simplest ways to disguise any A/C unit or other types of climate control equipment that may be causing problems. Bushes, shrubs and trees can also help to improve the overall look and feel of an exterior environment, enhance the level of privacy homeowners will be able to enjoy or even to shade key areas of the home in order to reduce cooling costs. When using shrubs or trees in order to disguise an A/C unit, complete concealment may not always be necessary. Obscuring the unit from view along a single angle or even simply using plants and trees to break up its silhouette may be all that is needed in order to improve the exterior appearance of the home. Shrubs and trees are not always the most viable option for disguising an A/C unit and issues like soil conditions, irrigation needs, and other concerns could make them a real liability. Vines and other climbing plants that may require very little top soil or that can thrive with minimal care and watering can be an ideal alternative for property owners who are still interested in using greenery to conceal their climate-control setup and equipment. A trellis, fence, or other barrier will be needed to provide support and all climbing plants should be positioned far enough away from the unit that debris or encroachment will not interfere with equipment operation. Greenery is not the only option available to homeowners and fences and screens can do just as well without the vines or ivy. Extending a backyard privacy fence in order to create a full or partial enclosure for an outdoor A/C unit is a very effective way to ensure that climate-control equipment will not have a detrimental impact on the landscape as a whole. The addition of a privacy screen, especially one that has been designed to match or compliment other outdoor installations can provide an eye-catching highlight that will be a welcome addition to its surroundings. Exterior A/C units are rugged enough to withstand the elements, but that does not mean that they are indestructible. Ensuring that drainage issues, fallen branches and leaves and other debris that may accumulate once the unit has been obscured from view is not a concern that should go overlooked. When fencing off an A/C unit with a privacy screen, trellis or similar installation, property owners may wish to create a protective enclosure, especially when it comes to outdoor areas that may be the site of rambunctious play or lively outdoor activities. From selecting and installing the best A/C unit to finding strategic ways to disguise your new outdoor system, it is important that homeowners use due diligence with their HVAC system. Routine maintenance and continual care for your system will not only extend its longevity but save you time and money. Proper care and professional solutions mean that upgrading an A/C unit or disguising existing equipment can be done with far greater ease. Preventative maintenance and routine service of climate-control systems and HVAC equipment is an important responsibility, and it is one that commercial property owners would do well to take seriously. Systems that have been properly maintained can provide years of dependable and issue-free performance while those that have been neglected can lead to a series of costly problems. From lowering utility costs to improving indoor air quality, professional HVAC maintenance and the routine servicing of all its associated equipment is both financially beneficial and time-saving. Even something as mundane as a dirty air filter can impair the overall efficiency of a climate control system. More serious breakdowns and mechanical issues could lead to problems throughout the system that will require more extensive repairs. 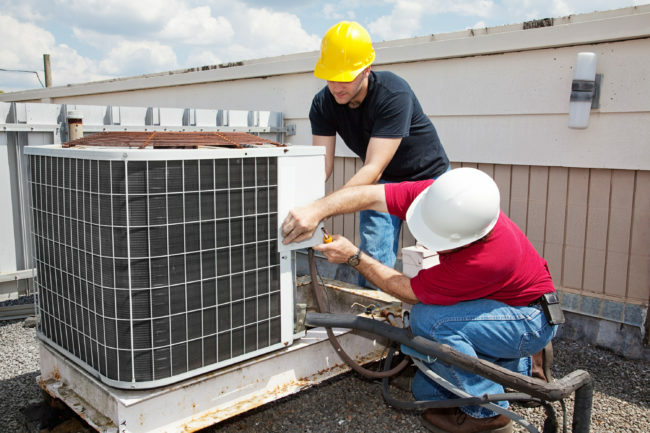 Routine inspection and assessment of all major components as well as performing seasonal or annual maintenance on A/C units, heaters and other commercial-grade HVAC equipment can go a long way towards minimizing operational costs as well as helping to ensure that repair-related costs are less likely to get out of hand. While breakdowns and mechanical failures may be little more than an inconvenience for residential owners, being unable to maintain a comfortable atmosphere and environment can be nothing short of a disaster for businesses. Commercial property owners would be wise to do all that they can to minimize the risk of equipment failure, especially for businesses that may require a climate-controlled environment for key aspects of their operations or workflow. Even a temporary disruption in service could lead to a loss of production. Preventative maintenance can often be arranged for a fraction of the costs that may be incurred should the system suffer from a mechanical failure. The warranty and protection plans that equipment manufacturers offer may be voided in the event that owners fail to arrange for maintenance or service to be performed at set intervals. Complying with all the requirements of a warranty protection plan can spare equipment owners from having to cover the full cost of repairs, replacements and upgrades. Voiding the warranty on their appliances and other HVAC equipment is a mistake that could end up costing commercial property owners much more than they might imagine. Even the best quality HVAC equipment may wear out or fail due to extended use or advanced age, but regular service helps to ensure that all major parts and components that make up the system are able to last as long as possible. Experienced professionals who have the tools, training and expertise needed to identify and address any potential issues that might otherwise escape notice can be a key asset when it comes to extending the operational service life of all equipment. Sporadic maintenance, ineffective repairs and service providers who may not be up to the job are all liabilities that may leave equipment owners with no other choice but to make a costly and premature replacement in the event that they system begins to fail. When it comes to older commercial properties and climate-control systems that may already be overdue for service, calling in the professionals can make a world of difference. Being able to find and resolve any issues that may be negatively impacting the system helps to ensure that owners are able to enjoy dependable operation for less overall cost.